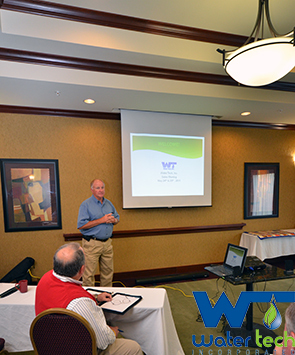 Training - Water Tech, Inc.
Water Tech’s training program is one of our newest, yet most requested services. Water Tech takes a great deal of pride in knowledge we have gained over the years helping our many customers treat water. It is with even greater pride that we are now offering training as one of our services available to both current and potential customers alike. On-Site – Water Tech will send one of our trained Water Treatment Specialist’s to your site to train your staff. Class Room – Water Tech also has a multi-media training room available for groups of up to 15 people to be trained, when a class room environment is more beneficial. Certificates of Completion – Water Tech issues a certificate of completion to each person who successfully completes one of our training programs.